Rohit (right) who has been nursing the Ahmednagar constituency for some time, is playing the role of a star campaigner for NCP, especially for his cousin Parth. 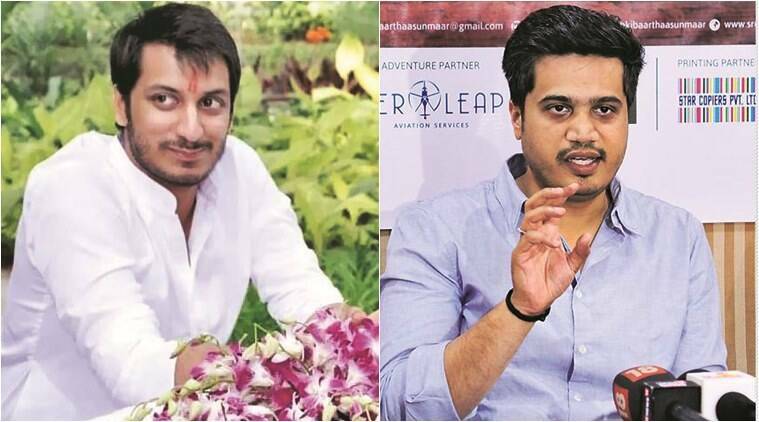 While his cousin Parth Pawar has finally managed to get a ticket to contest the Lok Sabha election, Rohit Pawar, the other politically-active grandnephew of Sharad Pawar, is content with campaigning for the NCP candidates. Rohit is the son of Rajendra Pawar, who happens to be the brother of Ajit Pawar, the former deputy chief minister of the state and nephew of the family elder and NCP chief Sharad Pawar. In the run-up to these elections, there were reports that Rohit might be fielded by the NCP from one of the constituencies near Pune. However, though Parth got the go-ahead from Maval constituency, Rohit did not. For the time being, therefore, Rohit, who has been nursing the Ahmednagar constituency for some time, is playing the role of a star campaigner for NCP, especially for his cousin Parth. “My USP is that I can communicate comfortably with a two-year-old as well as an 80-year-old,” Rohit says about his campaigning skill. “It’s not a skill as such but there seems to be a comfort level and people do find there is genuineness with which I speak and interact,” he says. While he has already travelled to several constituencies campaigning for his party, his focus no doubt is on Maval from where Parth is contesting, and Ahmednagar. “Be it Maval, Purandar, Kolhapur or Baramati, my main effort is to chip in with whatever I can for our candidates. For instance, at places where Parth is unable to attend, I try to fill in. Or, if NCP candidate from Ahmednagar Sangram Jagtap needs me to pitch in, I join with the team,” he says. Right now, however, he is preparing for a programme in Akluj on March 26 in support of Sanjay Shinde, who will contest the Madha Lok Sabha seat. The seat, which Sharad Pawar represented in 2009, has recently received national attention following the cross-over of Ranjitsinh Mohite Patil, son of sitting NCP MP Vijaysinh Mohite-Patil, to the BJP. “Sanjay Shinde is a strong NCP candidate from Madha,” Rohit says.